Voyaging safely and confidently under sail. ACTRESS is a beautiful 75′ brigantine designed by Murray Peterson in 1937 and built by Scott Kennedy in East Boothbay Harbor, Maine. With her 80,000-lb displacement and 56′-long deck, ACTRESS makes a wonderful platform for learning to navigate and sail our beautiful coast. Carrying nine sails, she offers plenty of opportunities for everyone to handle sails, ropes, and sail. Capt. Hans Vierthaler purchased ACTRESS in 2017 and has set her up to carry six passengers for a very unique sailing experience. Descended from grandparents who logged over 100,000 nautical miles, Hans Vierthaler has spent over 25 years sailing the coast of Maine. His love affair with boats started when he spent six years working for a sailboat rental company in Deer Isle, Maine, where he took care of a small fleet and taught sailing to vacationing summer residents. He then became interested in larger vessels and crewed on the schooners NATHANIEL BOWDITCH, AMERICAN EAGLE, BILL OF RIGHTS, and NEW WAY, as well as other, smaller boats. In the fall of 1991 he joined the crew at Brooklin Boat Yard as a rigger and carpenter, and in 1992 Hans earned his 100-ton U.S. Coast Guard license. 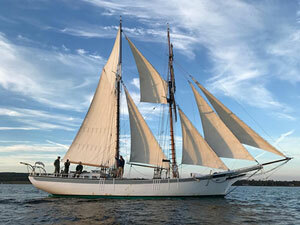 In 1994 he fulfilled a longheld dream and purchased the John Alden ketch ABIGAIL. After many wonderful years sailing the coast and teaching aboard ABIGAIL, he sold her in 2016. Hans bought ACTRESS, a 75′ brigantine (https://www.sailactress.com/), in 2017 and looks forward to more exciting years teaching students under sail. He has enjoyed teaching at WoodenBoat School for 22 years. Note: Students should be in good physical condition, have good balance and agility and the ability to enter and exit small boats from larger craft, beach or rocky shore. This is a five day course ending Friday evening. If you’ve ever wondered what it is like and how to make an overnight or extended trip along the coast, or an ocean voyage, this week with Hans will shed plenty of light on the subject. We offer this opportunity to the experienced, large-boat sailor wishing to advance his or her skills in the areas of coastal piloting, navigation, sail-handling, watch-keeping, safety at sea, and much more. Shipboard life and cooking aboard will also be part of this cruising experience. In addition to the topics covered in our COASTAL CRUISING SEAMANSHIP courses, the centerpiece of this liveaboard course will be journeying overnight to a destination. Students will be able to immerse themselves in the daily routines of a traditional sailing vessel, while learning how to choose and plan a long-range destination appropriate for weather and tide conditions, safety considerations, standing a watch, and nighttime piloting. The moon will be moving toward its fullest stage during this week, and we hope to take full advantage of it and experience the thrill of moonlit sailing. The week will start with Hans explaining the various systems, instrumentation, and sail configurations aboard his beautiful 75’ brigantine ACTRESS. After spending the first night in a secluded anchorage, Hans and his students will gather together and determine the best option for an extended cruise after listening to the weather, developing a backup plan should conditions change, and laying out a watch schedule. Tuesday you’ll set off on your adventure. Designed to build the confidence of sailors who are seeking new challenges and wish to go beyond the boundaries of day sails from the WoodenBoat waterfront, CRUISING THROUGH THE WATCHES may help one prepare for eventual boat ownership and/or realize the dream of an extended cruise. Whatever your reasons for signing on for this course, you will find your captain an experienced and patient instructor, and eager to share his 20 years of experience sailing in the coastal and offshore waters of Maine.